Smart luggage contains a battery and circuit board that can help you keep your devices charged during long journeys, track your luggage, and even prevent identity theft. Sounds great, but there are a few challenges to using smart luggage, too. Usually, smart luggage is hard-shelled and can contain any combination of these features. It makes travel easier by allowing you to charge your mobile devices, control TSA-approved locks from your smartphone, weigh the bag just by picking it up and track it both by proximity and by GPS location. Some bags even feature solar recharging capabilities, RFID-blocking liners to prevent identity theft, and portable Wi-Fi hotspots, in case you find yourself in an area where you can't get connected. While it's comforting knowing that you can travel across the country or even around the world with the assurance that you can always find and protect your belongings, there is one problem: Airlines aren't as excited about your new smart suitcase as you are. The problem is that most smart luggage is powered by lithium-ion batteries, which are known to be fire hazards, especially on airplanes. As a result, aviation governing bodies such as the International Air Transportation Association (IATA) and the U.N. International Civil Aeronautics Organization (ICAO) recommends that lithium-ion batteries not be stored in the cargo hold of an airplane. There are fewer controls in the cargo hold and unattended batteries can catch fire and cause devastating damage. To reduce risks, the IATA recommended that airlines stop allowing the use of smart luggage with non-removable lithium-ion batteries by January 15, 2018. The ICAO is expected to follow suit by 2019, but some airlines, including American Airlines, American Eagle, Alaska Airlines, and Delta Airlines, have already taken up the charge to ban these smart bags. It's not as bleak as it sounds. While stricter regulations against smart luggage are being implemented, those are only against the smart bags that have lithium-ion batteries that cannot be removed. That still leaves lots of options for some of the coolest luggage that lets you track, charge, and manage your belongings as you travel. The new requirements just mean that lithium-ion batteries must be removable, even from carry-on luggage. Smart luggage with removable lithium-ion batteries is still okay for travel so long as the battery can quickly and easily be removed. If you're checking the bag, you'll be required to remove the battery. If you choose to carry on your luggage, the battery can remain in place, as long as the suitcase is stored in an overhead bit. If the luggage needs to go into the cargo hold for any reason, you'll have to remove the battery and keep it in the cabin. 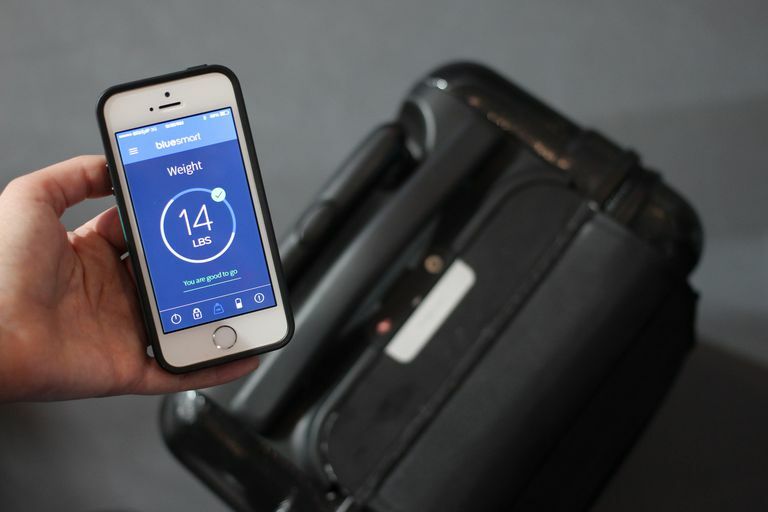 Some manufacturers, such as Heys, have begun to create smart luggage that uses triple A batteries that are safe to check. These suitcases don't have auxiliary charging for your other smart devices, but they do allow you to track your baggage, control locks remotely, and even have proximity alarms, so if you get too far away from the bag you'll receive a notification on your phone. When in doubt, check the website for the airline you're traveling with. And remember to check other airlines you might be transferring to during your journey. Each airline lists requirements for both checked and carry-on luggage, usually on a page that has specific baggage information. Travelers also have the option to forgo the smart luggage completely and use smart luggage tags. These luggage tags allow you to track your baggage using safe battery-powered sensors that can be monitored via a smartphone app. Dynotags are a great example of a smart luggage tag: They can hold personal emergency medical information, include detailed owner and travel information, and can be used on pretty much anything you need to track. The tags do not use batteries but do send information to a cloud service so you can retrieve your information at any time as long as you have internet access. Smart luggage is a significant improvement in travel technology. Just be sure when you're looking for the right smart bag that you choose one that has an easily removable battery. That means no tools required. If you have any questions about whether or not a specific airline will allow smart luggage onto their planes, and what the restrictions are, check out the airline's baggage policies on their website.